Until recently, humans did not significantly affect the much larger forces of climate and atmosphere. Many scientists believe, however, that with the dawn of the industrial age—and the burning of fossil fuels such as coal, natural gas, and oil—humans began to significantly add to the amounts of carbon dioxide and other greenhouse gases in the atmosphere, enhancing the planet's natural greenhouse effect and causing higher temperatures. "Climate change . . . is the single greatest threat that societies face today." —James Gustave Speth, environmentalist and dean of the Yale School of Forestry and Environmental Studies. James Gustave Speth, "The Single Greatest Threat: The United States and Global Climate Disruption," Harvard International Review, Summer 2005. http://hir.harvard. edu/articles/1346/. Around 1850, steam power was invented as a way to use coal energy more efficiently, bringing enormous changes in society and commerce. 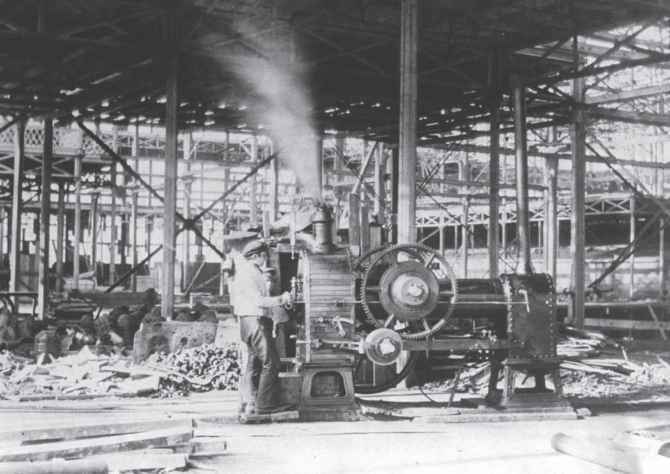 Here, a worker operates a steam engine in 1854.
engine, both technological developments that further changed the way humans lived and worked around the globe. The result of this rapid burning of fossil resources, many scientists believe, is rising concentrations of greenhouse gases that may be overheating the planet. Scientists have determined, for example, that concentrations of carbon dioxide have been increasing since the beginning of the Industrial Revolution. In 1750, there were 280 ppm of carbon dioxide in the atmosphere, but by 2005, the levels of carbon dioxide had risen to 380 ppm, an increase of over one-third. And much of this increase has occurred in recent years, since 1959, as world energy usage has expanded dramatically. The United States is responsible for almost a quarter of the world's greenhouse gas emissions, and China is the second-largest emitter. Other countries with high emissions include members of the European Union, while the lowest emissions come from various nations in Africa. The major source of human-produced greenhouse emissions— accounting for approximately 65 percent—is the use of fossil fuels to power industry, transportation, home heating, electricity generation, and cooking. However, carbon emissions are also increased when carbon-absorbing forests are cut down to make way for human developments and woodlands, grasslands, and prairies are converted into farmland for agriculture. As geography professor Michael Pidwirny explains, "Rural ecosystems can hold 20 to 100 times more carbon dioxide per unit area than agricultural systems. "6 Together, these human activities are believed to account for at least 28 percent of the Earth's total greenhouse emissions, with the balance produced by natural sources. Scientists have long suspected a link between industrialization and global warming, but serious study of the issue did not begin until the second half of the twentieth century. In 1896, Swedish scientist Svante Arrhenius was the first to suggest that the burning of fossil fuels adds carbon dioxide gas to the Earth's atmosphere and could raise the planet's average temperature. At the time and for decades thereafter, however, Arrhenius's discovery of the greenhouse effect was dismissed by the mainstream scientific community, which reasoned that such a major climate change would not likely be produced by humans and could only happen slowly over tens of thousands of years. Most scientists at the time also believed that the vast oceans would absorb most of the carbon dioxide produced by industry. By the 1950s and 1960s, however, improved instruments for measuring long-wave radiation allowed scientists to prove that Arrhenius's theory was correct. At that time, studies also confirmed that carbon dioxide levels were indeed rising year after year. In 1958, Charles D. Keeling, a scientist with the Scripps Institute of Oceanography in California, conducted the first reliable measurements of atmospheric carbon dioxide at Hawaii's Mauna Loa Observatory and found concentrations of the gas to be 315 ppm and growing. 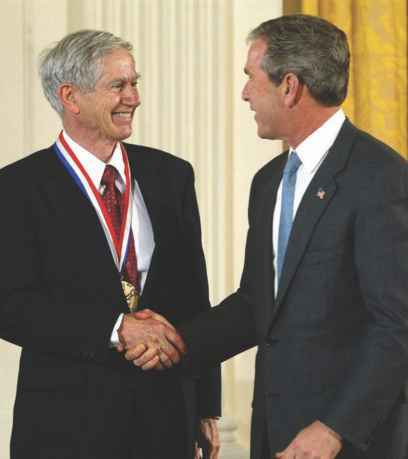 Charles D. Keeling, a scientist with the Scripps Institute of Oceanography in California, receives the National Medal of Science from President George W. Bush on June 12, 2002. Keeling took the first reliable measurements of atmospheric carbon dioxide and confirmed that carbon dioxide levels were rising every year. What is the role of industrial revolution in global warming? How did the industrial revolution effect global warming? How did the industrial revolution affect global warming? How did the industrial revolution impact global warming? How the industrial revolution affected global warming? How did the industrial revolution impact climate change? How industrial revolution impacted climate? How the industry effect tempertature? How industrial revolution impacted climate college? What does the industrial revolution have to do with global warming paragraph? How industries affect global warning? How did the industrial revolution affect Earth's atmosphere?